DHAKA/COLOMBO (Reuters) - Japanese Prime Minister Shinzo Abe flew to Bangladesh on Saturday for a two-stop tour of South Asia as the globe-trotting leader asserts Tokyo's interest in a region where it has ceded influence to China. Abe becomes the first Japanese prime minister to visit Bangladesh in 14 years and on Sunday will be the first to travel to Sri Lanka in nearly a quarter of a century. "I came here with 22 top leaders of business, ranging from infrastructure to safe water, with a strong hope of doing business in Bangladesh,” Abe told a forum in Dhaka attended by more than 100 executives from both countries. Asian great-power diplomacy has stirred to life since the rise to power of Indian nationalist Narendra Modi, who announced his intent to play an active role on the world stage by inviting regional leaders to his inauguration in May. Abe comes to India's backyard after hosting Modi for summit talks that yielded a Japanese pledge to invest $34 billion in India and launched a "special, strategic global partnership" to deepen security cooperation. The Japanese premier pre-empts Chinese President Xi Jinping, who travels to India and Sri Lanka later this month. "Prime Minister Modi is weaving a complex tapestry of relations with Asia," said Dayan Jayatilake, a political scientist, author and former Sri Lankan diplomat. From economic parity in 1980, China's growth has outstripped India's fourfold and Beijing has sought to recycle some of its vast export surpluses into foreign investments in resources and infrastructure in South Asia to feed its industrial machine. That rising economic presence in the Indian Ocean region has stoked concerns in New Delhi that China is creating a "string of pearls" that surrounds India and threatens its security. In addition to reaching out to Abe, Modi this week welcomed Australian Prime Minister Tony Abbott for the first solo visit by a foreign leader since his election, signing a deal for the supply of uranium for nuclear power generation in India. Although Modi seeks pragmatic economic engagement with China, in Tokyo he criticised countries with an "expansionist" mindset, a coded jibe against Beijing's assertive behaviour in Southeast Asia. Modi "has a new equation with China, which is reciprocated by the Chinese leadership based on economic pragmatism," said Jayatilake, "but he is also seeking closer ties with Japan and Australia in the Asia-Pacific region. "So we can discern multi-tiered Asian architecture in the new foreign policy of Prime Minister Modi." For Bangladesh and Sri Lanka, the increased attention of the region's largest economies creates the opportunity to attract much-needed investment and promote exports. Bangladeshi Prime Minister Sheikh Hasina visited Tokyo in May and Abe's return visit followed up on Japan's commitment to invest 600 billion yen ($5.7 billion) over the next four to five years. Abe praised Bangladesh's progress in developing its Bay of Bengal industrial belt but urged the country to do more to improve infrastructure and transportation. He praised the export growth achieved by the Bangladeshi garment industry. Japan also provided a $450 million development loan for the construction of a 1,350 megawatt coal-fired power station. In return, Hasina told Abe that Bangladesh had withdrawn its bid for a non-permanent seat on the U.N. Security Council for 2015-16 in favour of Japan. 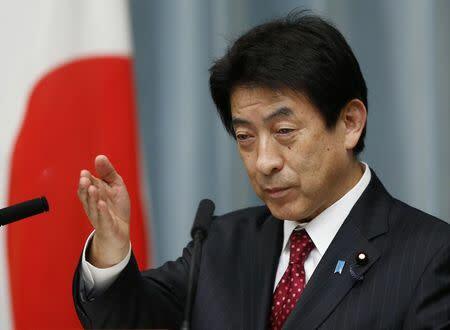 “I appreciate the decision, and it will foster the relationship of the two counties,” Abe said. For Japan, which has to import most of its energy, the Indian Ocean is a critical sea passage for supplies of oil and liquefied natural gas from the Middle East. Sri Lankan President Mahinda Rajapaksa will welcome the attention of Japan as a donor and investor and as a counterweight to China, which financed a $500 million port terminal in Colombo that was opened last year. "They (the Japanese) are aware that we are beholden to China's influence in many ways, so they would like to counter that," said Nanda Godaga, a retired Sri Lankan diplomat who follows Japanese foreign policy.